eyesitemd.com - Christian Serdahl, M.D. Dr. Christian Serdahl, a board certified ophthalmologist, graduated from the University of Southern California Medical School and completed his internship at LA County Hospital. He has both and Bachelors and Masters Degree in Chemistry from University of California at Santa Cruz. 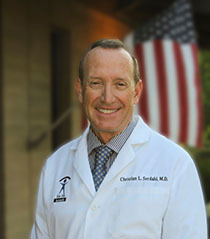 He completed residency training at UC Davis Medical Center and began private practice in 1991. Since that time he has held numerous offices in the Sacramento medical community including Chief of Ophthalmology at both Mercy General and Sutter Hospitals, President of the Alta Ophthalmologic Society, Medical Director of VSP, President of the Board of Directors of Communicare Health Centers, Clinical Professor of Ophthalmology at UC Davis Medical Center, Editor of Sacramento Medicine, a publication of the Sierra Sacramento Medical Society, President of Sight Savers International and a Peer Reviewer for the California Medical Board. He has written many articles and lectured on topics ranging from sports related eye injuries, surgical correction of presbyopia, new techniques in cataract surgery, and medical-legal pitfalls in eyecare. Along with his wife and colleague Clarissa Tendero, M.D., he has performed free cataract surgery on medical missions in Mexico, the Philippines and in Fiji. His interests outside medicine include skiing, windsurfing, backpacking, fishing and cooking. Copyright 2016 | Eye Site Sacramento Inc. | All Rights Reserved.